My name is Madeline Mulqueen and I’m almost a year into my photography journey. When it came to learning how to use a ‘’proper’’ camera, ie. ones that you don’t just point and click, I found being in nature was the best environment to learn. You stumble upon a beautiful tree, flower, or view and you know it’s not going anywhere, so you can take all the time you need to figure out your settings and experiment to find your style of shooting. And when the light changes it challenges you to work out what you need to adjust to get the right shot. This is a tough one in the beginning because when you get bitten by the photography bug you want to shoot everything. 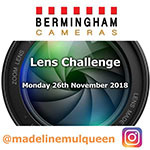 So with that in mind I thought doing a lens challenge with Bermingham Cameras would be great way to learn and discover what lenses you would use for different types of shots and styles of photography.